Discussion in 'DPF Game Room' started by unibear, Oct 25, 2013. OK, I thought I'd try to get a new game going. I'm going to post a picture of a pin. The next person posts a picture of another pin that comes to mind after seeing the first pin. Then the next person posts a pin that comes to mind after seeing the second pin, and so on and so on. The only rules are: (1) You need to post a picture of the pin and not just its name or pinpics number (although it might be helpful to list them) and (2) Briefly tell us why the previous pin made you think of the pin you posted. I thought of this pin since I've been trying to get it for ages, and just did!! I thought of this pin because they're both dressed like Mrs. Santa, and Jessica's purple gloves made me think of Minnie's pink shoes. Thanks for playing this game; I'm hoping we can come up with some more fun games to draw more people in to the DPF Game Room! This is a really cool thread idea! I do this all of the time with things in my room, haha! When I think of stained glass pins, I automatically think of this one because it was such an important scene in the movie and this pin (actually a 4-pin set) is just so beautiful. Sorry about the huge size; the pinpics picture didn't do it justice so I took a picture and uploaded it. Well, I was hoping that the previous pin would inspire someone to post a new pin. So, here is the pin that this pin made me think of. The opening scene of the movie has all of those cool stained glass windows and the old hag. This pin has the old hag and kind of looks like a stained glass window. Time to resurrect this game (hopefully). Lol I love the Yoda video! Alright, so I cheated... Yoda doesn't look like anything else in the universe hehehe!!! So I came up with... Yoda is so wise, and so well respected, just like Rafiki! And, both are advisers to their people! Welcome to the game—it's great to have another player. And the great thing about "stream of consciousness" is that any thoughts or directions you go in are fair game! Its not tea unless you're at a party! I really wanted a pin of Buzz Lightyear dressed as Mrs. Nesbitt but I couldn't find one!! This game has sat dormant for too long. 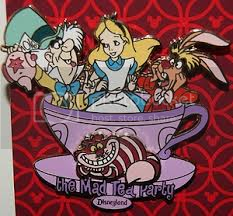 OK, Stitch is cross-dressing in this pin (much in the spirit of Bugs Bunny). So, I thought of a pin where another main character is dressed for the wrong gender. Enjoy! Well, Donald seems really scared or shocked by what he is seeing on his left. So, this gave me a great chance to go back and look through the "These Pins are So Wrong" thread to see what Donald was looking at. I had sooo many choices, but I chose this one. Too many ways to go with that last one ... Let's get this back on the mainstream! Well, this pin with Thumper reminds me of this other pin with Thumper. This pin sticks in my head because I've been trying to get it for ages, and every time someone "has" this pin, they actually have the pink version (which I already have). There are very few Stich pins I would like to own (obviously mostly with Jessica :lol: ) But when I see Stitch, I always think of my favorite pin with him that I would love to own someday! I love this pin, because I love it when Stitch dresses up as other characters (and Jessica doesn't even seem to notice)!! Stitch looks odd in this pin to me, especially the ears. It looks like he's about to take flight, which obviously made me think of... DUMBO!